I can’t really say that making your own muesli is the cheapest thing but it certainly will be the best that you are likely to eat. I can’t say how much we enjoy eating this for breakfast. It’s a bit unfortunate that maple syrup is so expensive here but it definitely distinguishes this muesli from most others. 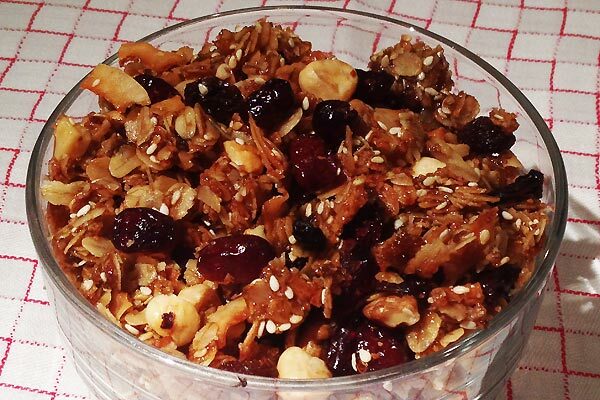 Muesli is easy to make and most of the ingredients are in your cupboard already. The two benefits of making your own muesli is that it will taste better than any you can buy, in addition you get to control the contents. You can buy your ingredients at the supermarket or choose only bio-dynamic. Whether or not you use maple flavored syrup and oats from the supermarket or go the whole way with real maple and only bio-dynamic ingredients, either way it will still be the best. 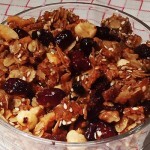 I have added another muesli recipe since I put this one up Muesli with Honey and Apricots. You will enjoy this recipe and I promise. If you want to save a bit of money you can use a maple flavored syrup which is a cost saver. Start with the nuts. Cut each hazelnuts in half and break up the walnuts into 4 or five pieces. I find it easier to get the right size using my hands instead of a knife on the walnuts. Then add all the dry ingredients. Don't add the fruit! Mix it up well with your hands. Then add the maple syrup and oil and with a large spoon mix well but gently to evenly incorporate the the wet ingredients. Pour the mixture onto a flat oven tray and spread it out evenly. Then place in the oven for 50 minutes. Remove the tray every 20 minutes and stir the muesli to to help it toast evenly. When done remove from the oven and add the dried fruit and mix well. Then return to the oven for 10 minutes. When done I usually pour this out on to a piece of baking paper and let it cool then store in a glass mason jar. You can run into problems with this recipe and once and a great while I have burned it and had to throw it all way. Since maple syrup is so expensive and nuts aren't a bargain either, it's really important to know your oven. Mine is a real horror story and I hate it but have learned a couple of tricks that help. I store mine in a 2 liter mason jar but any air tight container works well. This will keep about 3 weeks in a cool, dark, dry cabinet.